Are you interested in helping others? Learning about yourself? Learning to use Counselling skills? Would you like to study in a professional, dedicated and caring Counselling environment? We run regular courses throughout the year- please call for next date. Either as a voluntary, part time or full time career- begin your journey here! We’re running a unique 2 hour a week introduction Taster Course over 5 weeks to introduce you to counselling. If you have no knowledge of counselling this will give you some insight into the nature of counselling work and help you to decide whether you want to proceed with further counselling skills training. 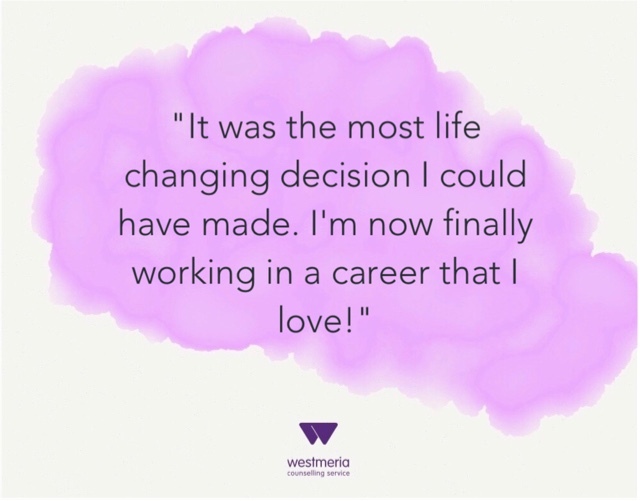 And if you decide it’s for you, Westmeria’s accredited Level 2, 3 and 4 courses will take you all the way to being a qualified counsellor. And if not, our taster course alone will help improve communication skills, as well as enhance emotional and social skills. Why not find out if helping others with a role as a counsellor is for you? Our taster course costs just £160! All tuition fees go directly towards helping individuals seeking counselling. This qualification is not suitable for those who are currently in a state of severe emotional difficulty and/or severe psychological confusion. If you are unsure please do not hesitate to ask. This course involves experiential elements that may involve some personal disclosure and associated personal developmental activities. Students will be asked to keep a portfolio and to keep a weekly learning journal. It is a requirement that students will attend the full course to be awarded a certificate. Wednesdays 6.30-8.30pm. Call for next date. £160. Please note that once a student has signed up for the course no refunds will be made. Please contact Jenny Powell and training@westmeriacounselling.co.uk for an application form. Or Westmeria Counselling, Bromley Park Medical Centre, 6 Daly Drive, Bromley Park, Bickley, Kent BR1 2FF. We keep our group sizes small- giving you the best opportunity to learn. You’d never find groups of 15+ on our courses. We teach the things many colleges don’t- CBT, creative therapy, knowledge of common mental health problems. We teach the same course info but with our unique additions, giving you essential skills that are often left out. Lots of one-to-one tutor time. Your tutor will offer one-to-one tutorials plus they are available to speak with any time. Our college is based inside our agency- that means your training is in the context of an agency, giving you more experience and knowledge. All of the profit our college makes goes straight back into our charity. That means your training actually directly helps clients to access counselling- it’s a 2 way street and we’re delighted to know we’re helping both trainee counsellors and clients on their journey’s.